Mountain Khakis Shady Lady Shirt Jac arrived at my house before the temps had even dipped to the 40s at night. However, I was instantly in love. Do you ever put on a piece of clothing or look at your wardrobe at something you have had for 10+ years and rejoice that the product was created? Maybe it is the gear dork in me, but I see this jacket in my life for the next 20 years! The name, Shady Lady Shirt Jac is also pretty sweet and pays homage to the Shady Lady Saloon in Jackson Hole, where Mountain Khakis hails from. The Shady Lady Shirt Jac is as functional as it is fashionable, which is a win win. The Shady Lady Shirt Jac is 50% wool/40% Polyester/ 10% Rayon. Its’ a tad itchy the first few wears along the neck until the collar splays out. The nylon taffeta lining is smooth and silky and slides with your layers rather than bunching. Add in 60 grams of quilted polyfill and you have a jacket that is ready for cool mountain mornings. The Shady Lady Shirt Jac takes its’ styling from the flannel line work jackets. It’s the only jacket I own that isn’t a shell or light puffy, so I call it my “fancy jacket” and use it to and from work and around town. The Mountain Khaki Shady Lady Shirt Jac features large buttons that are easy to manage with gloves or mitts on. The button front overlaps the fabric a few inches to keep cool breezes from dropping your core temp. The same cute buttons are found along the cuffs. The Shady Lady Shirt Jac features two generous front pockets to stuff your hands into and a small internal zip pocket to hold your valuables. The Shady Lady Shirt Jac is available in size XS to XL and runs true to size. The center back length for a size small is 26 inches and it hits 7 inches below the top of my hip bone (iliac crest). 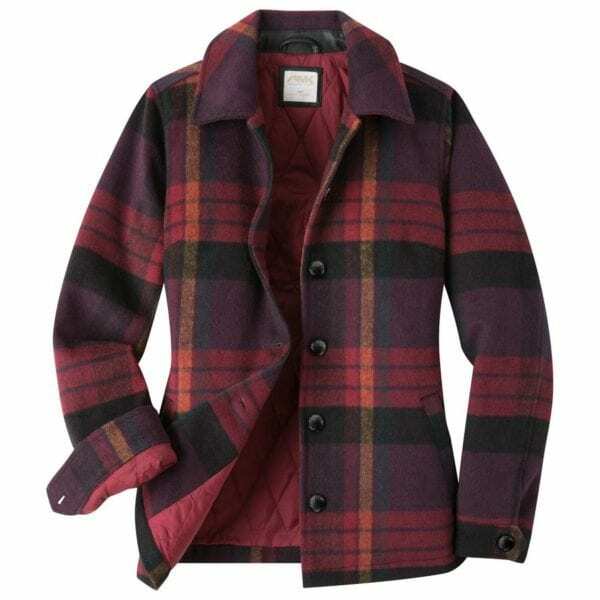 Available in Purple plaid only, Navy is sold out for the season per the Mountain Khaki website. Retails for $199. 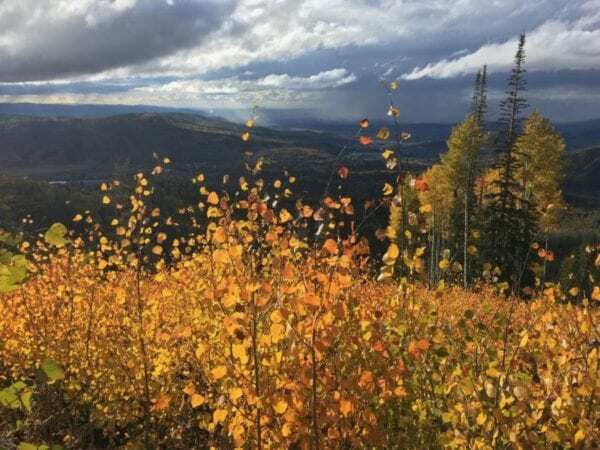 Traveling in the fall and winter can be difficult to bring the right clothes for every occasion and weather conditions. The Toad & Co Intermosso Dress is ideal for shoulder season traveling, fall through spring, because it can be worn with or without leggings and dressed up or down. 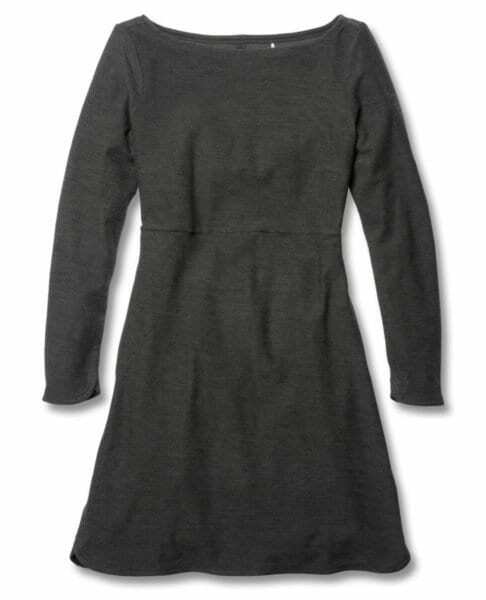 The Intermosso Dress features 95% polyester and 5% spandex that is cozy, moisture wicking, breathable, and soft without pilling. The fabric is also bluesign® approved fabric, meaning it’s eco friendly and features Polygiene®, which helps control odor which means you can wear it more and wash it less (more on Polygiene here). The fabric of the Intermosso Dress isn’t the only reason I love this dress; the fabric teamed with stylish boat neckline, scallop details along the hem and sleeves, as well as a cross back with small key opening makes this dress stand out. The dress features a small hidden zipper along the waist on the right side; I slide my ID, credit card, or even my iPhone SE in this pocket when I don’t want to bring a purse. The Toad & Co Intermosso Dress is available in Deep navy, Dark graphite, and Mahogany. The folks at Toad & Co deliver with the Shire Sweater Leggings. Their website describes the idea of loving a sweater so much that you wish you could wrap it around your entire body. The Shire leggings almost accomplish this for your lower half; only a jumper, or romper, or one piece sleepwear could achieve the entire body sweater! The Shire leggings are pricey at $124.95 per pair, but you are getting luxuriously soft Machino Merino wool that covers your entire lower half. A nice sweater costs pretty similar. I just hope my dogs don’t snag them when they try to cuddle with the softness. The body of the tights feature rib knitting and there is a Jacquart knit panel over the lower leg that breaks up the solid color and features a fun fairisle pattern. The Shire Sweater Leggings are available in 4 colors: Mahogany, Heather Grey, Deep Navy, and Deep Teal. The Shire Sweater Leggings are stretchy, soft, itch free, and feature an elastic waistband that doesn’t pinch or sag during the day. The leggings feature a 30.5″ inseam which is plenty long for my 33″ inseam when wearing with boots, but may be short for those that are taller than 5’9″ or have longer legs than even mine. To avoid shrinkage, I have been washing on cold and laying the leggings flat to dry, as instructed by Toad & Co. I am excited to pair these with longer tunics and my favorite sweater dresses this fall through winter. The North Face Utility Jogger Pant are perfect for crisp morning hikes, dog walks, climbing at the gym or outside, and lounging around the house. The Utility Jogger Pant is made from a rugged fabric that features 88% cotton and 12% Triexta. You may be asking, what is Triexta? Triexta is a polyester fiber that is spun into yarn and is known for high abrasion resistance, strength, ability to maintain strength and wrinkle resistance, yet is soft to the skin. The inclusion of this fabric is ideal in a product designed for some wear and tear. Don’t let the name “jogger” fool you, as these are not pants that you would wear jogging, rather they refer to the style as these pants are not overly breathable. The Utility Jogger Pant features articulated knees for easy movement, the elastic cuffs and waistband don’t bind or bunch, and there is an integrated drawcord for adjustments in addition to the traditional zip fly and button closure. One major bonus is the amount of usable pocket storage space. Often times women’s pants have tiny pockets that can’t fit more than your car key. 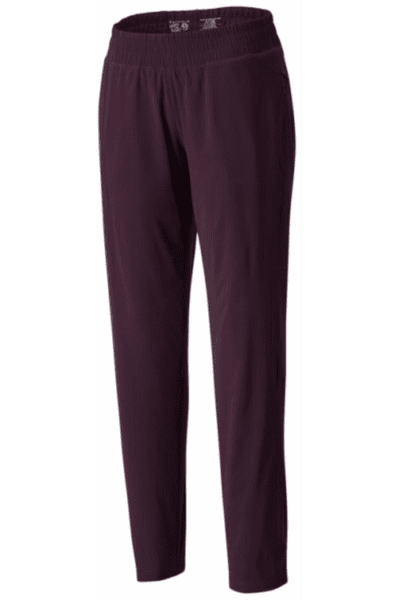 These joggers feature two large front pockets that are deep and can accommodate your entire hand as well as a zippered vertical pocket on the right thigh. There are also two flattering rear pockets. The Utility Jogger Pant is available in size XS to XL with a 28″ inseam. The North Face website has a handy fit finder that utilizes your height, weight, size, hip/abdominal shape, age, and size in other brands to help recommend a size for you. Based on the size finder, I should wear a size medium. I found the medium very room and baggy in the hips, thighs, and bottom. I don’t like tight joggers, but I think a size small would have fit me better. My suggestion is try before you buy or if you are in between sizes order down. The North Face Utility Jogger is available in 3 colors: Graphite grey, Sardenia green, and Black. The fabric softens with multiple washes and wears, has yet to pill, and doesn’t attract fur and dog hair like other canvas joggers/pants I have reviewed. 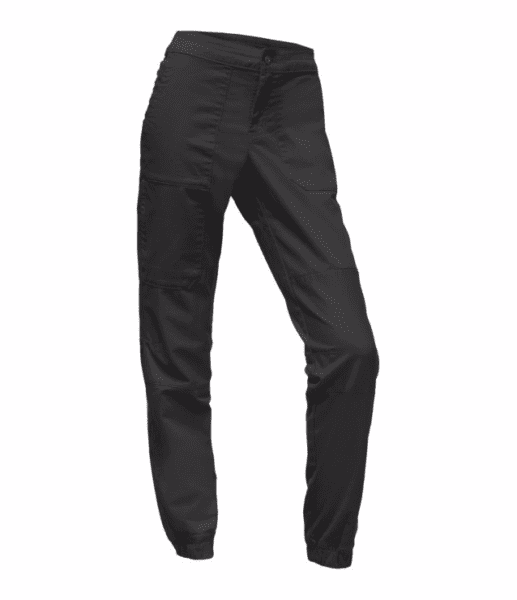 The Mountain Hardwear Dynama Lined Pant is a slim-fit hiking/climbing pant that is soft, stretchy, and warm. Winter hiking pants are often heavy and cumbersome; the Dynama provides warmth in a light weight package and moves with you. 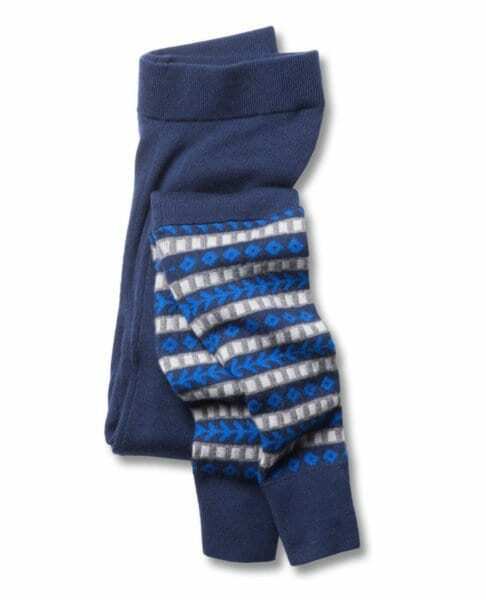 The soft knit lining provides warmth without binding or causing you to feel like you are wearing fleece lined ski pants. The pants are ideal for activities down into the 30s, as long as you are staying active. Much cooler and I’d add a pair of my favorite base-layers to extend the wearing season for cold and dry days. These pants are water resistant, but are by no means designed for winter alpine pursuits. The Mountain Hardwear Dynama Lined Pants are available in size 0 to 16, which means you get a more customized fit than traditional hiking pants that are available in size XS to XL. I ordered a size 6 and felt that they ran true to size based on the size guide. These pants are slim fit, but by no means are skin tight. The fit helps make these pants also blend in off the trail and resembler some of my favorite warm weather travel pants. The Dynama Lined Pants feature a 30″ inseam and are tapered at the ankle which helps to keep heat in and allows you to wear your boots over the pants to help seal in the warmth and the water or snow out. The Dynama Line Pant features two usable zippered pockets, one on each side. The wide elastic waistband is comfortable for all day wear and helps keep the pants secure. A rear stash pocket rounds out the list of features. The fabric of the Dynama Lined Pants dries quickly, and has yet to pill or tear. I do notice a lots of static with the liner and they often stick to my thighs when first out of my bag. 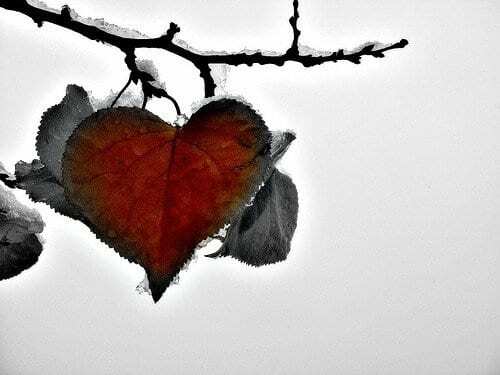 That is pretty typical with cold and dry Colorado weather, and if you are interested, dry skin also contributes. This wasn’t a big deal for me and they shook out and stayed relatively wrinkle free. The MH Dyanama Pant is available in Dark Tannin, Black, Graphite, Blue Spruce, retails for $85. The Dynama Pant was first offered in an unlined version, with 3 different lengths available. Check out MountainHardwear.com for more information. The Sorel Emelie Chelsea Boot is a functional and fashionable fully waterproof boot. The Emelie features seam-sealed waterproof construction and waterproof full grain leather. The combination makes these boots and ideal choice for wet fall days. Fall in the mountains means rain-snow mixes and these boots have been my go to. 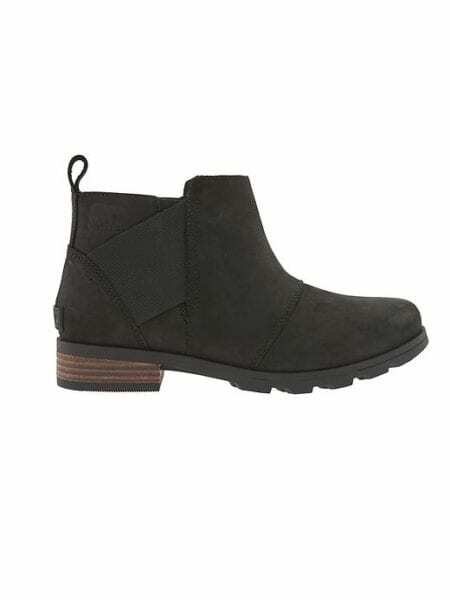 Chelsea boots by definition are elastic-sided, ankle high boots. The Sorel Emelie Chelsea Boot features a 3 6/7″ shaft height, a leather wrapped heel that measures 1 1/5″ and platform height of 2/7″. The heel and outsole is rubber and provides excellent traction and doesn’t provide a squeak sound when you walk on tile or linoleum. The footbed is removable and provides modest arch support. If you have high arches, you may need to add an insert for all day comfort. The toe box is plenty big and the boots run true to size. The Sorel Emelie Chelsea Boot is comfortable from day 1 without a break in period. I wear these on average for 10-12 hours a day with many miles in them. My feet stay warm without getting sweaty due to the loose fit and ability for air to circulate in and out along the top of the boot. The boots are a cinch to get on and off thanks to the contrasted wide band of elastic on the in and outside, as well as the generous leather pull loop at the back of the boot. Available in 4 different color combinations and retail for $150. Redwood with Black, Black with Black, Elk with Cordovan, Major with Black. My only criticism is that I wish I could afford to have these boots in every color! Available size 6-10 with 1/2 sizes and also size 11.